This DC-sponsored ad encourages you to stop spending your hard-earned cash on foreign comics. According to Bleeding Cool, the flier you see below is part of a DC-aproved-and-funded promotion run by A Comic Shop. 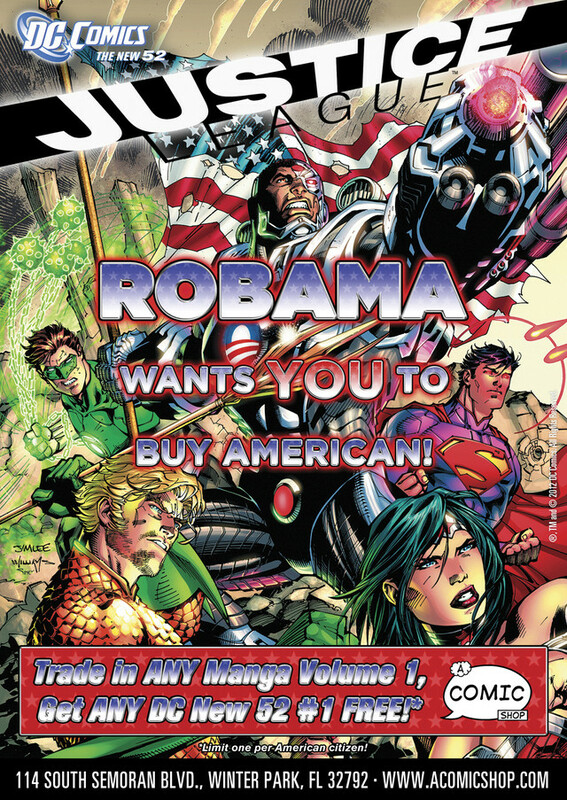 The ad features Cyborg, hastily rebranded as "Robama," and other members of the Justice League encouraging potential customers to "Buy American," and informs them that they can trade in ANY first volume of manga for ANY DC New 52 issue #1. A Comic Shop intends to distribute the flier at MegaCon, which will be brimming with anime and manga fans. Now ignoring the fact that concepts like "buy American" are terribly culturally limiting when it comes to art, that's just a bad deal. A volume of manga generally clocks in at around a hundred densely packed pages, while your standard comic book has around 30 pages, more than a few of which are ads. On the bright side, the ad does specify you can trade in ANY -note the capitals- manga, so if you've got any utterly appalling, tentacle-filled, loli manga to offload, now's your chance. Naturally the ad has got anime and manga fans up in arms, with many accusing A Comic Shop of resorting to what is essentially nationalist propaganda. However, according to Kent Ward, whose anime club frequently meets at A Comic Shop, people are taking the ad a bit too seriously. "For whatever reason, they feel like the ad above in question that will be used for part of a flyer is insulting to both manga and fans of manga," he wrote on his blog, shortly before expressing his desire to punch Otaku USA writer Daryl Surat in the throat. "And some have even called it nationalist propaganda!" "I don't know where the hell it says any of that and anyone who is local to the Orlando area knows that any form of advertising from A Comic Shop is intentionally silly." What do you think, readers? Is this jingoism in the service of capitalism, or a joke taken out of context? More importantly; what does that giant red button on Robama's crotch do?